Style Over Speed, once again, once again. Preparing to merge into traffic with her morning coffee and Nihola cargo bike. A propos the recent post about the postage stamp featuring iconic cycle chic, we figured we'd join the philately club and issue our own postage stamp. 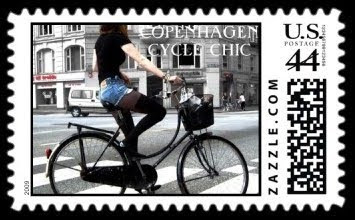 It's a completely valid US postage stamp, featuring our own iconic Cycle Chic image and it's available for purchase in a variety of denominations from Zazzle. Sweet stamps but I think I'll do without the 150% premium. indeed. zazzle is pricey. i make $3 on them and only really made the stamp to buy myself and send postcards with when i'm in the States next month. Love both of the girls's style! And stamps?!? That's awesome!! !